The archives of Tom G. Wolf. Action figures, Lego, toys and books about UFOs. This week I wrote a piece over at Astral Noize, about one of my pickups from this year's Record Store Day -- High on Fire's Bat Salad EP. You can read it here. Enjoy! Well, it's again been far too long since I posted on here. Work remains busy, and I haven't had much time for the blog in the last couple of months. But articles are planned, and I haven't forgotten about you. However, I did recently publish a new piece over at We Are the Mutants. In To Witness the Final Moment: 40 Years of Faces of Death, I take a closer look at cult phenomenon and video nasty Faces of Death, as well as the pre-digital days of "deathsploitation" media. I hope you find it an entertaining read, though I should warn that it may be a bit of a confronting read. In the meantime, thanks for hanging in there -- I hope to have some new articles up in the next week or so. Well, we’ve come to the start of 2019, which seems totally insane to me. Where did last year go? Christmas and New Year’s Eve were both good, and probably the ones I’ve enjoyed the most in quite a number of years. I worked in retail for many years, so I still get seasonal dread accompanying this time of year, but it’s finally beginning to fade as the years go by. I hope you enjoyed yours, too – or if you don’t celebrate, that you had a good time nonetheless. In last year’s roundup, I mentioned it was the first time in a while that I had really begun to feel like myself again. That continued this year, but there were still big chunks of 2018 where I felt I was pretty much operating on autopilot – get up, go to work, go home, sleep, repeat. Things were busy, busier than I would have liked at quite a lot of points. In practical terms, this meant I read hardly any books, only made it to the movies a handful of times, listened to an absolute bare minimum of new music and didn’t watch too many new TV series. Someone I follow on Twitter mentioned that they’d finished around 150 books this year, which is absolutely staggering to me. You would have also noticed that blog has been pretty quiet the last few months – but don’t worry, I haven’t forgotten about it. Just the overall busyness contributing to the autopilot factor, I guess. And to be fair to myself, most of this was down to simple logistics; for the first half of the year I was devoting pretty much every waking moment to Lost Tunnels, while the second half saw me starting at a new job. Both of these are time-consuming enterprises, and that means other stuff has to get left out by necessity. I should add that I had a pretty positive year on the whole. My book, Lost Tunnels, came out – please buy and read it if you haven’t already – and I’ve really been enjoying my new day job too. And I did watch a bunch of wrestling and listen to a ton of podcasts, I guess. So while I’ve never been a big one for New Year’s resolutions, as 2019 kicks off I find myself reflecting on some of the things I can do better over the coming 12 months. So here we go – if you’ve got any of your own, feel free to share them in the comments below. Really, this is the font from which everything flows. I wrote an article earlier this year about writing, and I mentioned that time management is an important part of ensuring you find time to write. But you’ll notice I also said I’m a natural procrastinator, and unfortunately that hasn’t changed either. So I’m trying to make a conscious effort to be more judicious in my use of social media in particular. It will never cease to amaze me how much time I can waste on it. As I mentioned above, one of the things I have spent quite a bit of time doing this year is watching wrestling. Your own feelings on that will vary wildly, but I know that for me it’s been a bit of a wake-up call to start taking better care of my health. I’m now in my thirties, and accordingly there’s been a natural slowdown of metabolism – but it’s not all down to that, and I know there are some lifestyle things that I need to take control of more effectively. I’m overweight and that’s not going to change without a concerted effort on my part. So 2019 is the year for change! 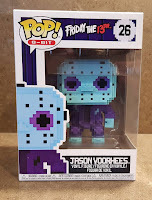 The problem with being a collector is that it’s very easy to buy something without necessarily thinking about how that thing will fit in with your collection, or even within your house. I’m sure many of you can relate. For example, in spite of not actually reading all that many, I did buy a ton of books in 2018. Now to be fair, I give a lot of books away once I’ve read them – they won’t be taking up space forever. But for the meantime, there are quite a few just lurking there both on my bookshelf and on my psyche. In practical terms, this year I definitely plan to take a longer, harder look at things I plan to buy before actually pulling the trigger. And probably cull a bunch of stuff I simply don’t need. I don’t really buy into the minimalism trend, but there is something to be said for doing a bit of a spring clean every now and then. One of my highlights at the end of last year was that I’d finished the first draft of my horror novella, Lost Tunnels. Well, I know I’ve mentioned this before, but I self-published it in June of this year. And if you haven’t already given it a read, you really should! Inspired by my old hometown and Lovecraftian weird fiction, my sister called it “nightmare fuel” which is one of the highest compliments I could have asked for. You can find it here for Kindle. But where to now? Obviously I want to do another one. But what will it be? That’s a big question, one that I’m still nutting out. I'll keep things updated on here as I know more. In 2018 I wrote some stuff that I was really proud of, particularly over at We Are the Mutants – I hope you enjoyed it too. There are plans for more into the future. But I also spent a lot of hours working on stuff that felt like, and probably was, a waste of time and energy. Believe it or not, I frequently get people asking me to write things for them, and I try to be very selective when saying “yes”. It’s easy to underestimate just how long things can take to produce, and the temptation for greater exposure is often very hard to say no to. There was one site I stopped writing for in 2018. I don’t want to trash it at all, because it’s a good site and the people who run it are nice and very professional. But the work I was doing simply wasn’t translating into additional attention for me or my work, which was a stated part of my goal in doing it in the first place. It would be a very valuable opportunity for others looking to build a portfolio when they’re starting out – but given that writing is already my day job and I have this blog, it simply wasn’t delivering what I’d been hoping it would. It was time to cut the cord. If you’re a writer starting out, don’t be afraid to do the same if you feel that the working relationship isn’t mutually beneficial. Well, that’s it for me. Hopefully you found something useful in there for yourself, too. As always, keep your eye on Twitter, Facebook and Instagram to keep up to date on what’s happening with me and the Lupine Book Club. Jim Cornette has previously noted that he would prefer wrestling to go back to its territory days, but I feel like he doesn’t understand that it already has – just on a far bigger scale than anyone could have anticipated. Thanks to the internet and the rise of streaming, WWE no longer has a monopoly over wrestling product in a given market. Sure, they’re far and away the most dominant company, but there are viable alternatives in a way that simply didn’t exist when I was a teenager growing up in suburban NSW. New Japan Pro-Wrestling (or Shin Nihon Puroresu if you want to be that person) are one of the biggest alternatives out there. In operation since the early 70s, a number of WWE stars past and present have actually spent some of their formative years with them – Finn Bálor, Tommaso Ciampa, Daniel Bryan, A.J. Styles and Shinsuke Nakamura, to name just a few of the current crop. Yet they’re far more than a simple feeder organisation; for fans who love wrestling as an entertainment form but are burnt out on the WWE’s oft-simplistic approach, they offer something genuinely different. And if you pay close attention, you might see a few wrestling trends take hold before they’re exported to the world. Today we’re talking about one of NJPW’s current biggest stars – Kenny Omega. Love him or hate him, Omega has helped establish a model of success for a wrestler outside of the WWE. Admired worldwide for his distinctive look, clever character work and athleticism in the ring, he’s achieved a level of mainstream recognition that would once have been unthinkable for a non-WWE star. There are many others more qualified than me to give you a career overview, but his Wikipedia page is a good a place as any to start with. In years past, this might have meant that he got an action figure. 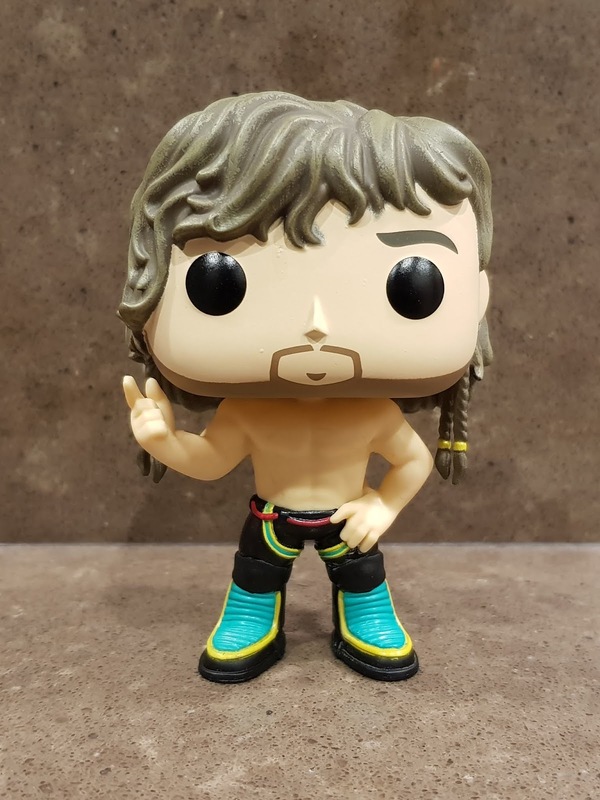 But in 2018, it means that he’s one of the first NJPW wrestlers to be transformed into a POP. However, he’s not the first. While Kenny’s box is marked as “1”, the Young Bucks 2-pack actually beat him to the shelves several months ago. I guess the pose is meant to be a rough approximation of his in-ring gun pose, while not being totally overt. It works well enough, and it helps him stand out on the shelf among my host of other wrestling POPs. The outfit is a good look too; I can find a photo of Kenny in this outfit, but I’m not actually familiar enough with his wider career to pinpoint when this was. If you know, feel free to sound off in the comments. 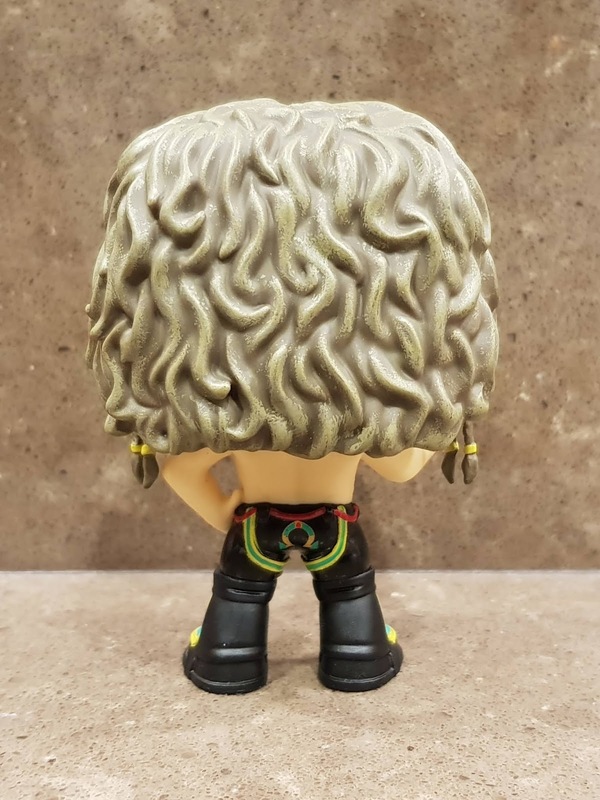 Last but not least, given that his distinctive curly hair wouldn’t necessarily translate well to the POP format, I think Funko have hit a good compromise with this braided look. It’s not perfect, of course. There are some points where the paintwork could be a little better – particularly around the hairline – and the gluing could be a little less obvious, but it’s easily on-par with any of the WWE figures. My main complaint is more to do with scale. 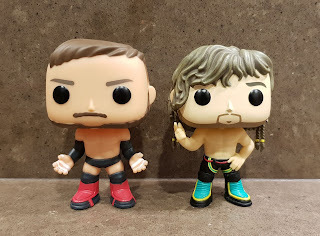 While POPs have never been the benchmark for scale accuracy, Kenny appears to be slightly smaller than his fellow wrestling brethren. Kenny is billed as around 6’ in real life, while Finn Bálor is billed as slightly shorter – but would you guess that to look at this picture? Granted, some of this is likely due to the initial waves of WWE POPs being released during a period when the style was considerably more cartoony than it tends to be today. Even the newer releases have preserved that aesthetic. 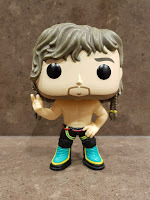 But it irks nonetheless; anyone buying Kenny is more than likely doing it to include alongside a bunch of other wrestling POPs who now look disproportionately large. It’s not enough to suggest not buying it, but it’s annoying. Still, Kenny has quite a variety of looks, and it’s entirely possible we’ll see more of them released in future. Perhaps one of them will rectify the issue. “I am sort of very much a part of representing an alternative. If my motivation was money, I would already be in the WWE. I was down on the current product and I wanted to create a style and have matches that my friends, my family and other athletes could watch and enjoy. There's a certain kind of wrestling fan that will only like a certain style. They think that's the right way and that's okay but I'm not trying to impress those people. Those people are already kind of set in their ways. I'm trying to open the world to a different style, what pro-wrestling has the potential to be." The rumours will likely continue for the foreseeable future – but in the meantime, you can still have your dream matches in POP! form. Scale issues aside, Kenny Omega is a great start for the line, which will hopefully actually include some Japanese wrestlers soon too. Podcasts are still a relatively new venture for me. I mean, back in 2011 I guest-starred on one that was associated with a now-defunct website I was writing for. But until 2016, I didn’t pay very much attention. The time and commitment involved just seemed like too much, and I didn’t want to filter through all the crap to find the good stuff. Still, around that time I had a number of recommendations from friends, and I thought it was time to dip my toe in. Since then it’s been quite the voyage of discovery – so while I don’t want to be that guy who’s always telling you to check out podcasts, you might enjoy some of these if you like this site. If you’re anything like me, you’ve probably spent your share of time watching or reading about bad movies, maybe even listening to a podcast or two on the subject. That’s fun and all – but what if there was an equivalent for bad books? Well, I Don’t Even Own a Television – or IDEOTV for short – steps up to fill that void in your life. J. Williams Friedman and Chris Collision take you on a journey through some of the best and worst trashy books on the market. I’ll freely admit that I am not a particularly fussy reader; I certainly don’t always agree with their takes, and I’ve personally enjoyed a bunch of the books featured. But both J and Chris are very funny and very easy to listen to, and you do also hear about some interesting books that you might not otherwise have come across. Welcome to Oh No, Ross and Carrie!, the show where we don’t just report on fringe science, spirituality, and claims of the paranormal, but take part ourselves. Follow us as we join religions, undergo alternative treatments, seek out the paranormal, and always find the humor in life’s biggest mysteries. We show up - so you don’t have to. In a stark contrast to many other pieces of skeptical media, they largely avoid a snarky or condescending tone. They’ve been doing this in one form or another since 2011, covering just about every fringe topic you could think of – and yes, they have done Scientology. The second book-related podcast on here. 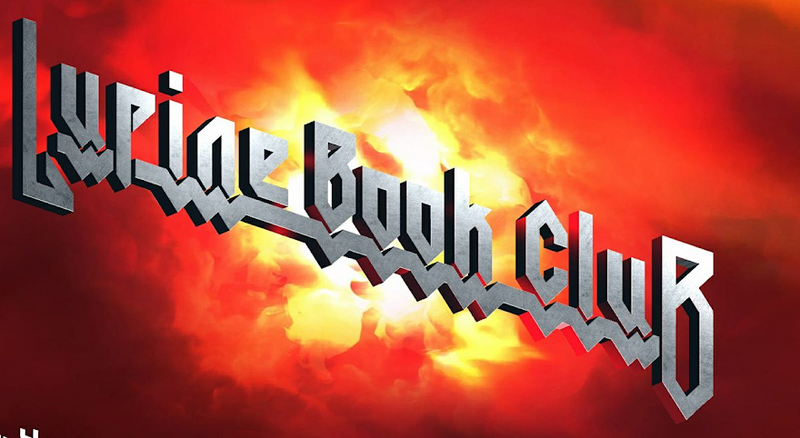 Do you like extreme metal, leftist politics, reading and crude humour? I sure as h*ck do. DEATH // SENTENCE is the most recent entry to my regular listening, and indeed it seems to be a fairly new podcast, apparently having debuted earlier this year. Hosted by a British guy named Gareth and avant-garde writer Langdon Hickman, they’re two very well-read guys who cover a lot of interesting ground. As you might have guessed from looking at this site over the years, I like collecting toys quite a bit – so it’s only natural that I’d be pushing a podcast about toys on here. Adam and Blake take you through the wild, whacky world of collecting, along with all the fun and frustration that comes along with it. The show’s been running since last year, and it’s really hit its stride. Highly recommended, and both great about interacting with their fans on Twitter too. Irish comedian/wrestling tragic Kefin Mahon and his life partner Jo Graham talk through the basics of wrestling fandom. I came across Kefin through an episode of the previously mentioned IDEOTV podcast, and subsequently discovered he had been podcasting across a few different shows for years. Kefin and Jo do a fantastic job of making the oft-impenetrable world of professional wrestling accessible to the wider public. If you’ve ever thought about checking it out but weren’t sure where to start, I can wholeheartedly recommend How2Wrestling a fantastic way to kick things off. There’s also a great, welcoming Facebook group that’s grown as an offshoot of the podcast too – Team Friendship. As regular readers may know, I write the occasional piece over at We Are The Mutants. Well, another one went up this week -- I tackle true crime for the very first time, with a look at the sinister history of murderabilia. John Wayne Gacy's artwork features prominently, so depending on your workplace, you may find it a little NSFW. You can read it here. You can see other guest articles I've written for various sites here, too. 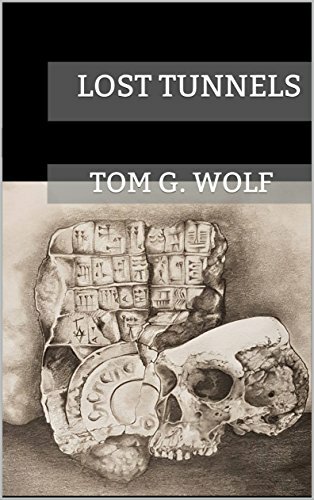 As some of you are aware, I released my debut novella Lost Tunnels back in June. So the other day I sat down with the Australasian Horror Writer’s Association (of which I'm a member) for a bit of a chat about it. Creatureplica Interview -- with Jean St. Jean!